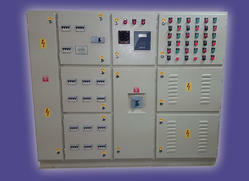 Manufacturer & Supplier of Automatic Power Factor Panel. Our product range also comprises of Control Panels, Electrical Control Panels and VFD Control Panel. We are engaged in offering our clients a high quality range of Automatic Power Factor Panel. These power factor panels are manufactured by our adept professionals using high grade components and modern technology in compliance with industry quality standards. Provided power factor are used for maintaining higher power factor. Our power factor panels are stringently checked on industry defined quality parameters in order to assure its flawlessness.